Intel has expanded its processor lineup to include several new Ivy Bridge variants spanning across both mobile and desktop markets. Accompanying the fresh batch of silicon will also be a number of welcome price adjustments to existing CPUs. Ivy Bridge is the worthy successor to Sandy Bridge, the 32 nanometer architecture which defined Intel's Core offerings in 2011. Ivy Bridge's 22nm design draws less power, generates less heat and offers higher performance than that of prior generations. Here's everything you need to know about Ivy Bridge. Interestingly though, Intel's new wave of CPUs still manages to include our aging, venerable friend from 2011. While Ivy Bridge chips seem to round out higher-end offerings, Sandy Bridge cores will be covering the low-end, namely Pentium and some Core i3 packages. The inclusion of Sandy Bridge silicon is particularly fascinating because it subtly defies rumored plans of sunsetting the aging architecture. 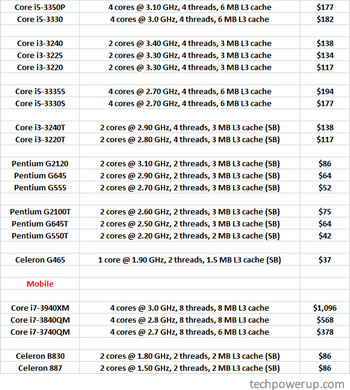 Amongst the new CPUs are the Core i5-3350P, i5-3330, i5-3334S and i5-3330S. These models are clocked at 3.10GHz, 3.0GHz and 2.70 GHz, respectively, with corresponding price tags of $177, $182, $194 and $177. The "P" on the 3350 denotes the absence of integrated graphics while all i5 CPUs come with Turbo Boost but lack hyperthreading. For i3 CPUs, we'll see i3-3240, i3-3225, i3-3220, i3-3240T, i3-3220T models ranging from 2.8 to 3.4 GHz and priced between $117 to $138. The "T" models indicate Sandy Bridge architecture. Although all i3 CPUs listed are exclusively dual-core, they are endowed with hyperthreading which effectively allows four total threads. Also, unlike their i5 brethren, listed models do not include Turbo Boost. Earlier this year, Intel launched Ivy Bridge by introducing 14 new chips to its mobile and desktop lineups. In May, the company released a second wave of Ivy Bridge chips.